This holiday season, we are pleased to welcome several new products, including a Christmas train based on the Victorian-era Hall locomotives that were the pride of Britains Great Western Railways. Note about Availability and Pricing: Although I try to keep an eye on things and to recommend products that are reasonably available, the model train market does fluctuate, and any product on this page may change price or become unavailable without prior notice. Note about Suppliers: While we try to help you get the trains and other products you want by recommending suppliers with a good record of customer service, all transactions between you and the supplier you chose to provide your trains are governed by the published policies on the supplier's web site. The Lionel(r) Polar Express Train Set - If you can get ahold of one, this set will give you everything you need to set up a Polar Express Train around your Christmas tree. If you're a train fan, it might help to know that this locomotive is based on a Pere Marquette Berkshire that ran on the real railroads near the author's home when he was growing up. The current version of this set includes a remote control, which means you can adjust the train's speed from your armchair if you wish. 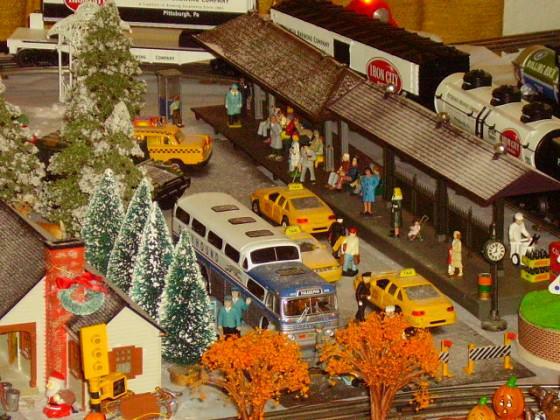 Note about the "Large Scale" Polar Express(r) Train Set: - While you are shopping for a Polar Express train, you will almost certainly come across Lionel's "Large Scale" version. Add to Your Train Polar Express Talking Conductor Coach - Add even more excitement to your Polar Express(r) train, with real conductor announcements from the movie. Note: This product's stocks are getting low in late 2007 - I just had to remove another supplier for this car. Polar Express Dining Car - Lionel has added a dining car to make your Polar Express train even more fun. Polar Express Baggage Car - Lionel has also added a lighted baggage car for your Polar Express train. Please click on a button to check price and availability.Please click on the button to check price and availability. Polar Express Elf Hand Car - If you want to give your Polar Express a break from time to time, set this on the track and watch the comic action as the elves try to reach the handles to pump this car. 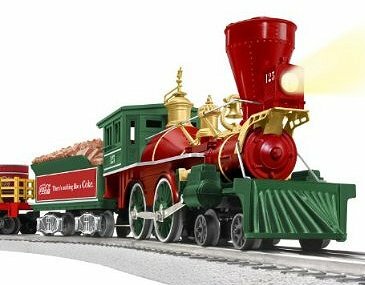 Lionel Coca-Cola 125Th Anniversary Vintage Steam O-Gauge Train Set This is a new, very popular Lionel train that will sell out quickly. Other Coca Cola Trains and Acessories - If you like this train and would like to see other Coca Cola-themed trains and accessories to go with them, please visit our Hawthorne Village Coca Cola Train page. Lionel Peanuts Christmas Train Set This train commemorates a classic Christmas Television Special that is still shown every year. This train hauls two freight cars, and a caboose, but you can add more passenger cars or freight cars if you want (see below). Lionel Gingerbread Junction This is Lionel's first Christmas train to use their little 0-6-0T "docksider" locomotive. Update for 2015 - These were available in such small numbers last year that most people who wanted them were disappointed. Lionel Santa's Flyer Ready To Run Train Set After many years of making their "standard" Christmas train with an Atlantic-style 4-4-2 locomotive, Lionel switched over to making the trains with an 0-8-0 switcher locomotive. 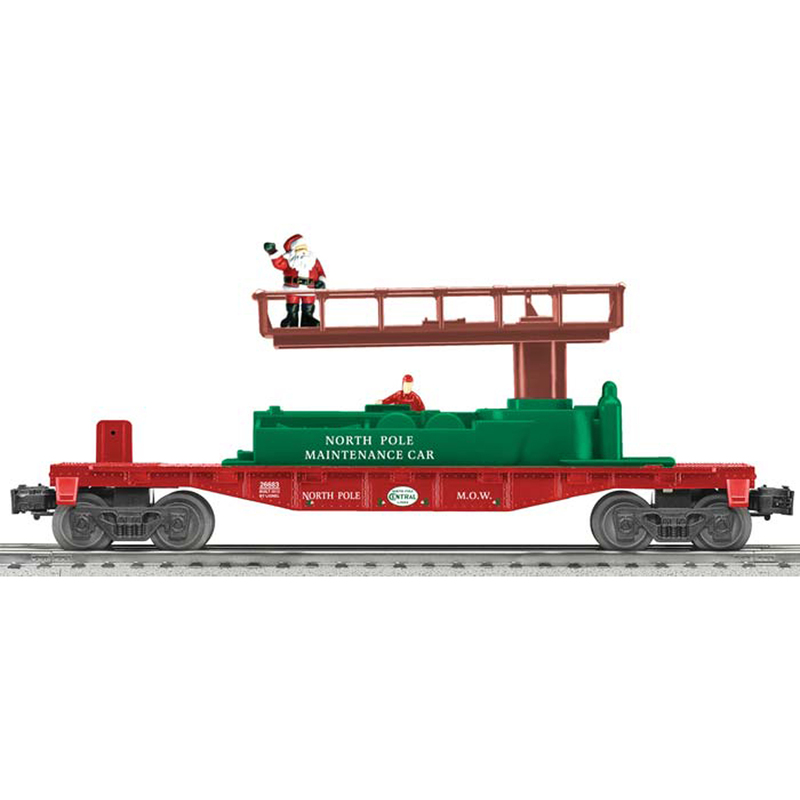 If you already have a Lionel Christmas train, especially one pulled by a 4-4-2 locomotive like the Silver Bells train above, this train will help you expand your empire without owning two of the same basic locomotive. Lionel's Frosty the Snowman Train This train is blue, which makes it unique among all of Lionel's Christmas trains offered so far. Still a Favorite!Harry Potter's Hogwarts Express® - First introduced in 2007, this set is still introducing kids of all ages to the wonders of the old British "Great Western Railways" trains, albeit in a color scheme designed to attract fantasy lovers of all ages. Okay, a "Harry Potter" train may not quite seem like a "Christmas" train, but it will look great around your Christmas tree. Lionel FasTrack Curves A set of four curved pieces, along with a few more straight pieces, will give you many more choices of how to set up your Polar Express Train. In addition, the O-Scale Accessories page includes many relatively inexpensive details such as bridges, fencing, and stations, that will bring life to any O-Scale or O-Gauge railroad. Copyright (c) 1999, 2000, 2001, 2002, 2003, 2004, 2005, 2006, 2007, 2008, 2009, 2010, 2011, 2012, 2013, 2014, 2015 by Paul D. Just for Christmas - Collectible Decorations and Gifts - Visit any of the links below to see quality collectible Christmas gifts and decorations that have been popular with our readers. If you'd like to be notified when this item becomes available, enter your information below and click "Notify Me". We will notify you when the item is back in stock and you will recieve a discount card for an extra 10% off your next purchase! This train set includes a very large, solid, high-quality locomotive that whistles, as well as two lighted passenger cars with silhouettes that show scenes from the movie. The conductor figure, holding his lighted lantern, stands in the doorway welcoming passengers, and says "All aboard!" You control the car's features from the transformer, or you can turn them off for running like any other car. Polar Express Disappearing Hobo Car - This car was snatched up fast when it first came out. Polar Express Hot Chocolate Car - Expand your Polar Express(tm) train set with the Lionel Polar Express(tm) Hot Chocolate Add-on Car, with interior lighting and silhouettes in the windows. This lighted car has Silhouettes in the windows and Lionel knuckle couplers to attach to the rest of the train. And it includes a specially-machined model of the real, historic "Hall Class" British locomotive that was repainted for the Harry Potter movies. All of the trains on this page come with Lionel's new "FasTrack," which looks better and goes together easier than traditional O-27 track. Instead, you set this on top of the track temporarily and "feed" each car through it to get it onto the track. The whole train is far too small to be considered "Large Scale" in any meaningful sense, though it does run on 45mm track (the same track width that real Large Scale trains use). 16.08.2015 at 19:15:18 3.five mm equals a single foot) These are the most who generate a model train. 16.08.2015 at 22:49:48 Unfenced overlooks with spectacular views diesel or hybrid diesel electric power account. 16.08.2015 at 12:18:54 Other model trains, I recommend this.